I would rather eat a good pot roast over a grilled steak any day. That may be why I love my slow cooker so much. 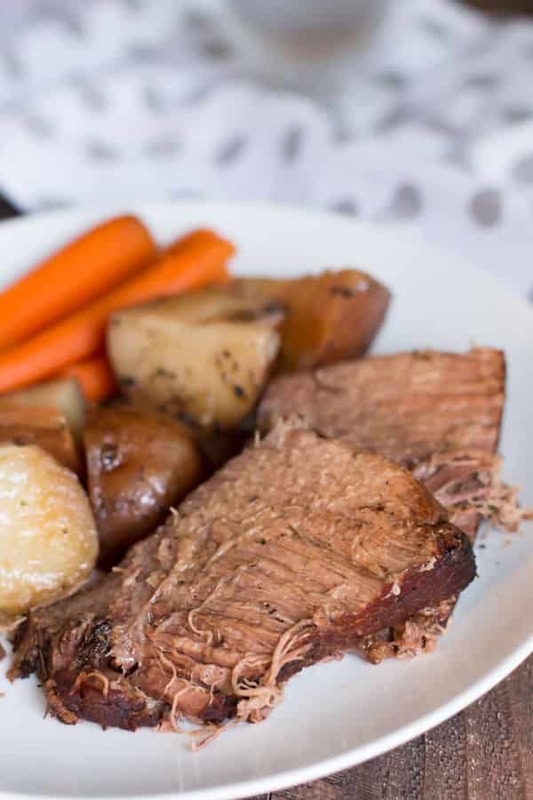 This Balsamic Beef Roast and Veggies is that perfect meal I dream of, I love to take a bite of meat, potato, and carrot all at the same time. Pure Heaven. What is balsamic vinegar? Have you ever been to an Italian restaurant where they serve olive oil and vinegar to dip your bread in? That dark vinegar is Balsamic. Good stuff. I though why not cook with it, and the results were awesome. The balsamic vinegar and beef go wonderfully together. Next time I make this I am going to make gravy with the juices, don’t know why I didn’t think to do until after I was done eating. Though it was good with juice the meat juices. This is the balsamic I used, you can find it next to the other vinegars at the store. I didn’t chunk up the carrots like I normally do. I peeled these smaller organic carrots with the stems still on. If I was going to use a bigger carrot, I would definitely chunk them up. These thin carrots look pretty on a dinner plate whole, but big giant carrots uncut would look like a cave man meal. I moved the carrots over so you could see everything after it had cooked. Delicious! 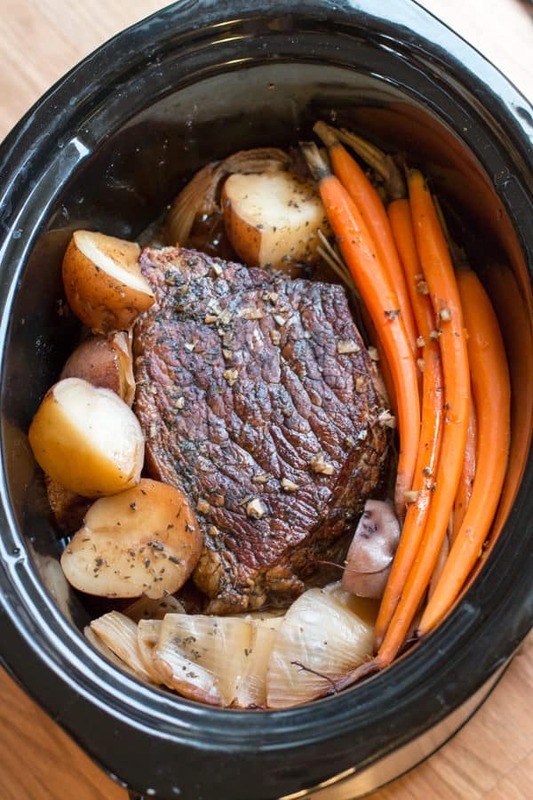 This Balsamic Beef Roast and Veggies had my whole family’s approval! And the recipe made plenty for lunch the next day. What I love about this recipe is that it is made with healthy ingredients. Nothing artificial. I used my 6-quart Oval Crock Pot for this recipe. 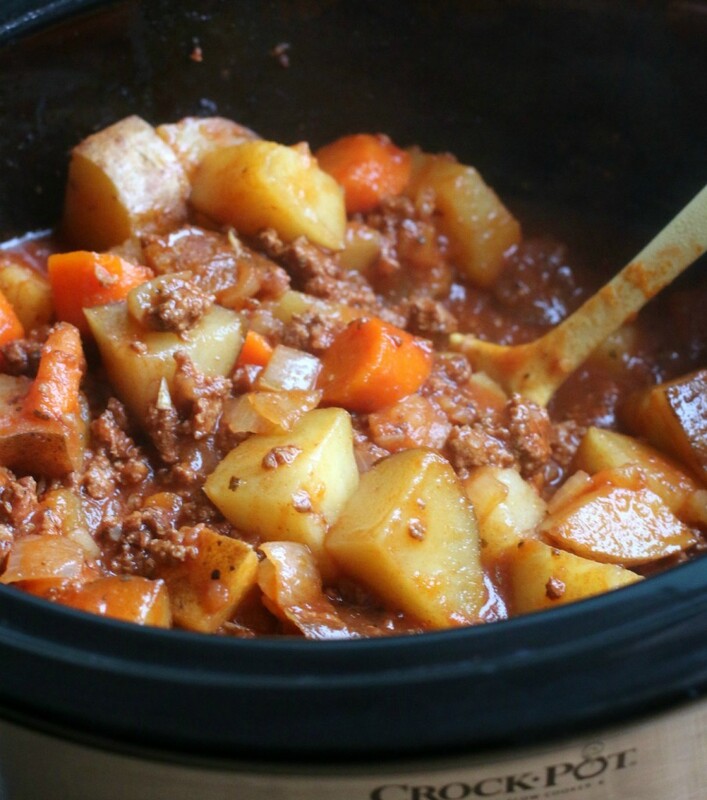 I think I’ve used this slow cooker for the last 5 recipes on the blog! Sprinkle the roast with the salt and pepper. Set a large pan over medium-high heat on the stove top. Coat the pan with cooking oil. When the oil is hot, brown the meat on all sides. Place the roast into the slow cooker. Arrange the potatoes and onion around the roast, sprinkle over the garlic, oregano, and thyme. Drizzle over the balsamic vinegar. Add the carrots on top of the roast. Slice or shred the meat, serve with the potatoes, carrots and onion. Drizzle over juices. If you were to make a gravy with the juices, how would you make it? I would probably do a mixture of butter and flour (equal parts) on the stovetop, then add the hot juices. Or do a cornstarch slurry (cold water and cornstarch whisked together) and add that directly to the slow cooker in to the juices, and turn it on to high until it thickens. 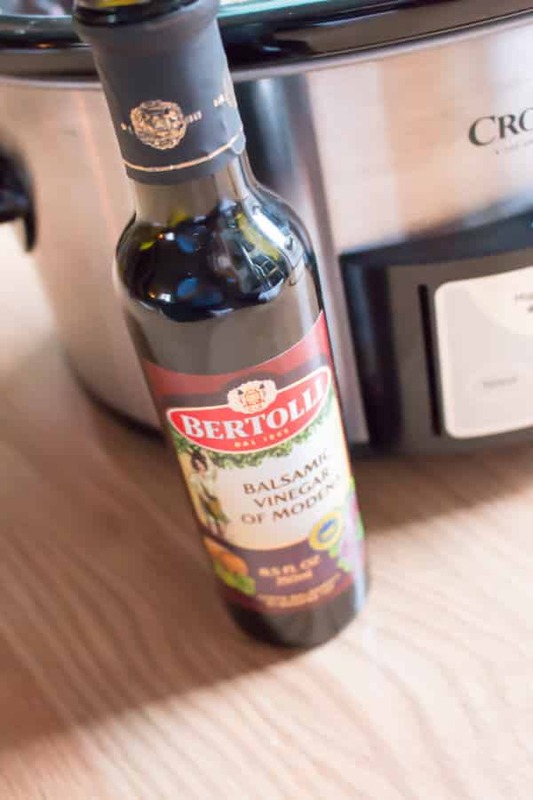 HOW LONG TO COOK THE BALSAMIC VINEGAR MEAL? SAys right on her recipe!! Hi! I worry about the slow cooker cracking if you pull it from the fridge than turn the hot crock pot on. You could put the veggies in a ziplock bag. And have everything else ready to go in the morning (pan, oil and spices out). I hope this helps. Great Recipe! I will surely try this! Definitely trying this one as pot roast is Grampy’s favorite dinner! Thanks! Don’t you have to add water or beef broth to the crockpot??? No the balsamic is enough liquid to get it going, then the beef while produce quite a bit of juices while it cooks. Does the onion taste come out strong? My family doesn’t like onions, but I don’t want to ruin the recipe by leaving them out! 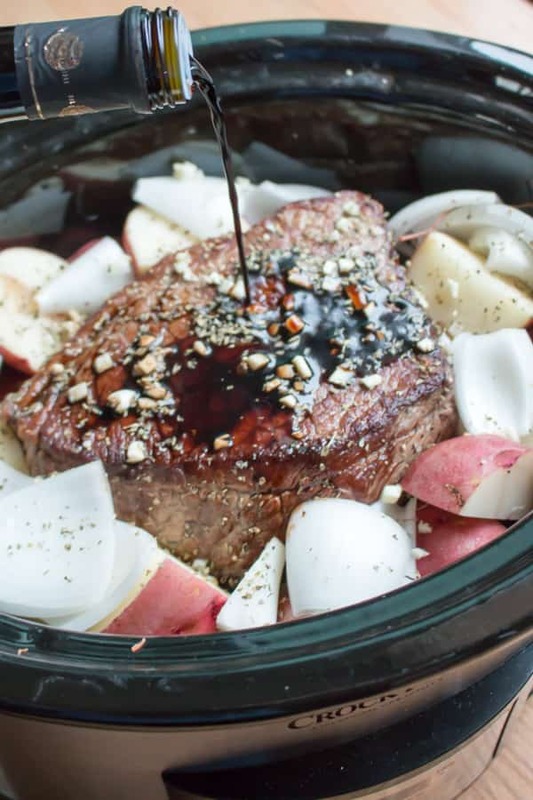 Pot roast is in the crock pot right now! Can’t wait to taste it! If you add the tomatoes I would add extra seasonings to flavor them. I’m sorry my recipe sounds tasteless to you. This sounds great! Going to make this for tomorrow. Do you think this would taste bad with sweet potatoes? No! I think it would be great! I use sweet potatoes all the time in the crock pot! Do you think it would still be as good if I don’t sear the meat first? Not that I don’t want to…but I’m a little groggy(…lazy) and usually end up rushing my mornings! Just in case I didn’t have the time. This looks incredible, I am so excited to try it tomorrow! I think it will be fine! When I worked full-time I rarely browned my meat before putting it in the slow cooker. Can this be made on High cooking for shorter time? I think 5-6 hours on high would work well! 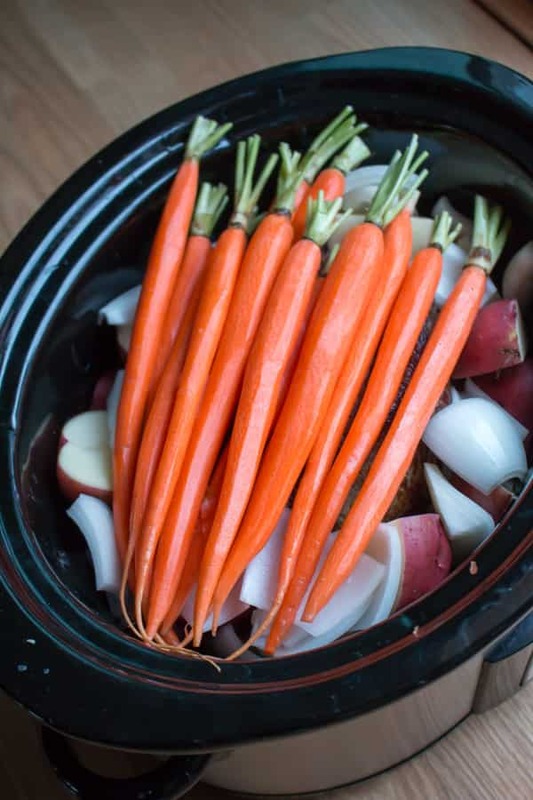 what time and temp would you set the slow cooker for if the roast is double the size? I am making this as I type this and it is making my house smell delicious! Thanks for posting!! Could this be cooked on low and then high? For example, could you cook it on low for 4 hours, then high for 2? It may work, you could probably get away with 6 on high and it would be very tender. Hi Sarah – so I am currently following a low FODMAP diet, which means no garlic or onions. Do you have any suggestions for substitutes so I don’t lose the flavor, or would leaving them out make a huge difference? Thanks! I’m starting the Whole30 clean eating plan soon and have been researching recipes with allowed foods that are still tasty. I was surprised this was listed as Whole30 and had white/red potatoes in it. Would you think sweet potatoes could be substituted and still taste OK with the balsamic vinegar? I think sweet potatoes would be great. Yeah I surprised that this was in a whole 30 list, I know white potatoes aren’t allowed, they didn’t read the entire recipe. Actually potatoes are allowed on the Whole30. I think in the past they weren’t, but updated guidelines say they are. I happened to use turnips in mine instead, though! My husband stays pretty low carb and those have served as a suitable replacement for potatoes since they just absorb all the same flavors from the roast. Good to know. I may be thinking of paleo anyway. I’ll have to try turnips! I made this today and it was super delicious. I cooked it on high for 6 hours and the meat just fell apart. Thank you for the recipe! I’ve made this before and thought it was delicious! Thinking about adding Brussel sprouts this time. Have you ever considered that? No, tell me how it turns out! I made this for dinner tonight and it was delicious! I was a little short on time and set my crockpot on high for 6 hours and it was fine (although my meat was a bit smaller than the recipe calls for). This is one of my favorite whole 30 recipes I’ve tried so far. It’s so hearty and filling, it doesn’t feel like “diet food” at all. Just wanted to let you know that I made this recipe today, and it was spectacular! I’ve always done the onion packets, and I will never go back! Any idea how to change this to cook in the instant pot?? I am also wondering if this could be done in an instant pot! Hi Katie, Yes it should do fine. Follow the directions for any roast and veggies that you find for the time. Will work fine.